Nichols College is a top choice for business and leadership education because of its distinctive career-focused approach to learning in and out of the classroom. Nichols students are encouraged to reach their potential through experiential learning, hands-on opportunities, and individualized mentoring. Every Nichols student takes part in our signature Professional Development Seminar, a four-year program of one-credit academic courses dedicated to developing professional interpersonal skills. You’ll learn to represent yourself and your brand as you move through the program by interviewing, speaking, writing, and launching your career. No one gets lost in our community of 1,200 students, and you’ll enjoy access to some of the brightest minds teaching and doing business in New England today. Our faculty are composed of professionals who have succeeded in their own fields and now want to give back through teaching and mentoring. 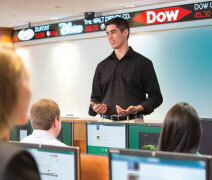 Many of our alumni credit Nichols’s solid business education, nurturing atmosphere, and close-knit campus as the underpinning for their personal success. Located in the sprawling hills of Dudley, Massachusetts, the scenic Nichols College campus is rooted firmly in New England life but is also conveniently less than an hour from five major cities, including Boston, and just three hours from New York. The campus itself is a mix of historic and modern buildings, with classic New England architecture that sets the tone for learning. Many of our original halls have been beautifully renovated to incorporate the latest technology and encourage team-based learning. 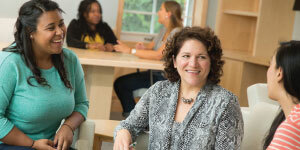 Eighty percent of our day students live on campus in one of our 10 residential communities. Campus life is centered around the Fels Student Center, which features a variety of student-life offices and dedicated spaces for studying, collaborating, and learning. Fitness and competition are core competencies for business leaders and successful professionals in every market. We place a premium on these skills with a storied history of championships across our 21 NCAA Division III athletic teams. We also proudly sponsor four club teams and a variety of intramural activities. The state-of-the-art Recreation and Athletic Center features a weight room, aerobics room, squash court, and an indoor multiuse facility for basketball and volleyball with an elevated running track. Outdoor facilities include the newly revamped Vendetti multipurpose field, an eight-lane running track, tennis courts, basketball courts, a volleyball court, a campus-wide Frisbee golf course, and fields for baseball, softball, and soccer. College is a life-changing investment, so we make sure to deliver every student an industry-leading education at an affordable price. With an average 2018–2019 annual net cost of just $27,600, we’ve been recognized by PayScale.com as a top school for return on investment, ranking in the top 15 Business schools for three years running. Give yourself a head start on an amazing life when you earn a degree that nets the average Nichols student higher earnings than most of our competitors, according to the US Department of Education’s College Scorecard.